GST Service Tax Exemptions to be continued in GST as decided by GST Council The fitment of rates of services were discussed on 19 May 2017 during the 14th GST Council meeting held at Srinagar, Jammu & Kashmir. The Council has broadly approved the GST rates for services at Nil, 5%, 12%, 18% and 28% as listed below. The information is being uploaded immediately after the GST Council’s decision and it will be subject to further vetting during which the list may undergo some changes. The decisions of the GST Council are being communicated for general information and will be given effect to through gazette notifications which shall have force of law. (iv) any service, other than services covered under clauses (i) to (iii) above, provided to business entities. Services provided to the United Nations or a specified international organization. Exemption may be notified by way of issuing notification under section 55 of CGST/SGST Act. Services by an entity registered under section 12AA of the Income tax Act, 1961 (43 of 1961) by way of charitable activities;[Charitable activities may be defined as presently in notification No 25/2012-ST.
(c) five year integrated programme in Management. Services by government, local authority or governmental authority by way of any activity in relation to any function entrusted to a municipality under Article 243 W of the Constitution. Services provided by a tour operator to a foreign tourist in relation to a tour conducted wholly outside India. Services provided by Government or a local authority to a business entity with a turnover up to rupees twenty lakh (ten lakh rupees in a special category state) in the preceding financial year. Services by way of transportation of goods by an aircraft from a place outside India upto the customs station of clearance in India. Services provided by Government or a local authority by way of issuance of passport, visa, driving licence, birth certificate or death certificate. Services by Government, a local authority or a governmental authority by way of any activity in relation to any function entrusted to a Panchayat under article 243G of the Constitution: this shall be continued by way of notification undersection 7(2)(b) of CGST/SGST Acts. Services provided by Government by way of deputing officers after office hours or on holidays for inspection or container stuffing or such other duties in relation to import export cargo on payment of Merchant Overtime charges (MOT). Services by an acquiring bank, to any person in relation to settlement of an amount upto two thousand rupees in a single transaction transacted through credit card, debit card, charge card or other payment card service. this shall be continued by way of notification under section 55 of CGST/SGST Acts. Taxable service provided by State Government Industrial Development Corporations/ Undertakings to industrial units by way of granting long term (thirty years, or more) lease of industrial plots from so much of tax leviable thereon, as is leviable on the one time upfront amount (called as premium, salami, cost, price, development charges or by any other name) payable for such lease. Services provided to the government by way of transport of passengers with or without accompanied belongings, by air, embarking from or terminating at a regional connectivity scheme airport, against consideration in the form of viability gap funding (VGF). Services provided by training providers (Project implementation agencies) under Deen Dayal Upadhyaya Grameen Kaushalya Yojana under the Ministry of Rural Development by way of offering skill or vocational training courses certified by National Council For Vocational Training. (r) Any other insurance scheme of the State Government as may be notified by Government of India on the recommendation of GSTC. (h) Any other insurance scheme of the State Government as may be notified by Government of India on the recommendation of GSTC. Services by way of collection of contribution under Atal Pension Yojana (APY). Services by way of collection of contribution under any pension scheme of the State Governments. (iii) renting of shops or other spaces for business or commerce where charges are Rs 10,000/-or more per month. where the consideration for admission is not more than Rs 250 per person in (i), (ii) and (iii) above. Services provided by Government or a local authority where the gross amount charged for such services does not exceed Rs.5000/. 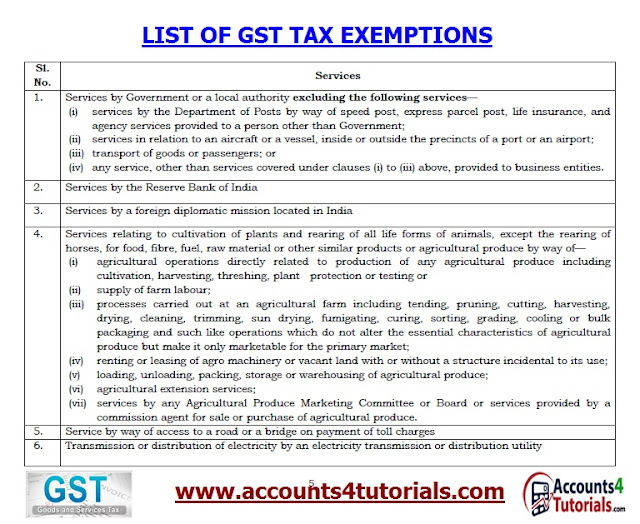 year; [This may be continued by way of an omnibus threshold exemption from payment of GST under section 9 (4) of CGST/SGST Act in respect of supplies upto Rs 10,000/-]. I am working in Manpower Services Provider like Security and Cleaning Services i.e House keeping services, Proprietor firm in Andhra Pradesh. What GST Rate Applicable? Please give advise to how to monthly return filing procedure. Visit the following urls for requirements.